I was broken hearted, no doubt about that…but I’m the comeback kid and that’s a natural fact. 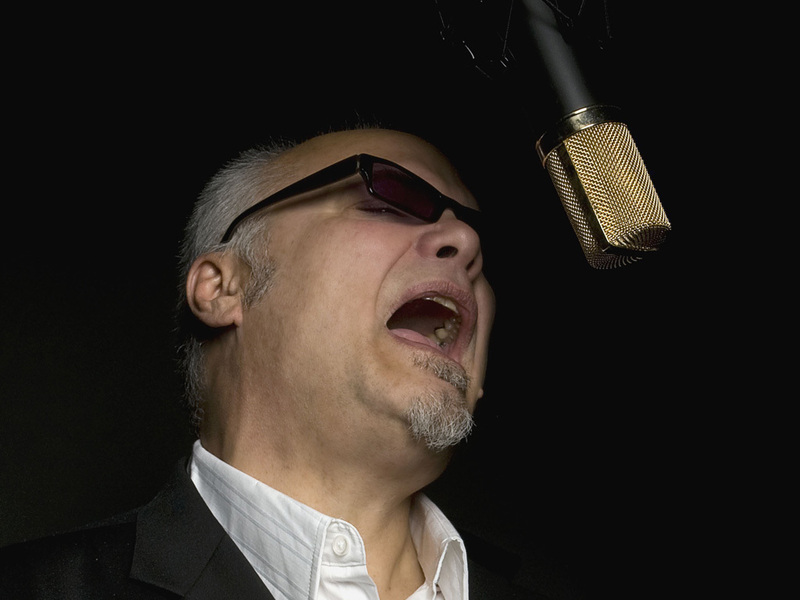 Award-winning vocalist/songwriter/harmonica icon Curtis Salgado sings and plays with soulful authority, never giving less than 100 percent. He plays each and every show like it’s the most important gig of his career. He recalls the time when his friend, the great chitlin’ circuit singer Buddy Ace, put on the show of his life, singing his heart out, making three costume changes, all while playing at a casual house party. Salgado was floored. “I was just there playing with my band, hanging out in cut-offs and a t-shirt, and there’s Buddy treating the gig the same as if he was performing at the Apollo,” he says. From that moment on, Curtis vowed that every time he got on stage he would deliver his very best shot. Salgado’s been perfecting his craft since he first began playing professionally in the late 1960s. He fronted his own group, The Nighthawks, inspired John Belushi to create The Blues Brothers, was co-star of The Robert Cray Band and sang and toured with Roomful Of Blues. He released his first of eight solo albums in 1991, hitting the road hard year after year. Salgado and his band toured with The Steve Miller Band and Curtis spent a summer singing with Santana before being sidelined by serious health issues in 2006. He’s battled all the way back, and, after a full and complete recovery, has been tearing up concert stages all over the country. Salgado won three 2013 Blues Music Awards including the coveted B.B. King Entertainer Of The Year. He also won for Soul Blues Male Artist Of The Year for the second consecutive year, and for Soul Blues Album Of The Year for Soul Shot. Salgado effortlessly mixes blues, funk and R&B with a delivery that is raw and heartfelt. He moves with ease from the tenderest ballads to the most full-throated stompers. Blues Revue says, “Salgado is one of the most down-to-earth, soulful, honest singers ever, and his harmonica work is smoking and thoroughly invigorating...rollicking, funky and electrifying.” With his Alligator Records debut, Soul Shot, Salgado is set to reach the largest audience of his career. Soul Shot was produced by funk and R&B guitarist Marlon McClain, drummer Tony Braunagel and co-produced by Salgado. “I wanted to make a soul record that you can listen to and dance to,” says Salgado. And that’s just what he and members of The Phantom Blues Band, along with additional guest musicians, did. Soul Shot speaks loud and clear to contemporary audiences, carrying on the timeless spirit of 1960s and ‘70s R&B. The album features four Salgado originals and seven carefully chosen covers. “I don’t care who writes the songs,” Salgado says, “as long as I can make them my own.” Songs by Johnny “Guitar” Watson, George Clinton, Otis Redding and Bobby Womack flow into and out of Salgado’s own compositions. Each track—the slow-burning ballads and the driving rockers—is delivered with the vocal power and passion of a musical master. “Soul Shot was the most challenging recording of my career,” he says, “and it’s the solid best thing I’ve ever done. That’s a fact.” Born February 4, 1954 in Everett, Washington, Salgado grew up in Eugene, Oregon. His parents were “hip,” according to Salgado, and his house was always filled with music. His parents’ collection included everything from Count Basie to Fats Waller, and his older brother and sister turned him on to the soul and blues of Wilson Pickett and Muddy Waters. His father liked to sing, and would point out specific passages in a Count Basie or Ray Charles recording for Curtis to pay close attention to, and the youngster soaked it all up. He attended a Count Basie performance when he was 13 and decided then and there that music was his calling. Curtis began devouring the blues of Little Walter and Paul Butterfield, fell in love with the harmonica and taught himself to play. As a hungry-to-learn teenager, his musical abilities grew by leaps and bounds. He played his first professional gigs when he was 16, and by 18 he was already making a name for himself in Eugene’s bar scene. Salgado quickly developed into a player and singer of remarkable depth, with vocal and musical influences including Otis Redding to O.V. Wright, Johnnie Taylor, Muddy Waters, Little Walter, Sonny Boy Williamson I and II, Lightnin’ Hopkins, Howlin’ Wolf, Otis Spann and Magic Sam. With his band The Nighthawks, he became a must-see act in Eugene and throughout the Northwest. Salgado earned a reputation for high-intensity performances and a repertoire that was informed by his encyclopedic knowledge of blues, soul and R&B music. In 1973, Salgado met Robert Cray and the two became fast friends. They jammed often, sometimes sitting in with each other’s bands, often playing double bills. In 1975, Salgado had the idea to start a blues festival in Eugene in order to meet and play with as many established blues stars as possible. The festival became an annual event, allowing Curtis to back up, befriend and occasionally house legends including Floyd Dixon, Frankie Lee, Luther Tucker, Otis Rush, Clifton Chenier, Sonny Rhodes and Albert Collins. In fact, it was Salgado—whose Nighthawks backed Collins locally—who crowned the blues legend with the title he would carry for the rest of his career: “The Master Of The Telecaster.” In 1977, comedian/actor John Belushi was in Eugene filming Animal House. During downtime from filming, Belushi caught a typically balls-out Salgado performance. Afterwards the two got to talking and a friendship grew. Before long Salgado began playing old records for Belushi, teaching him about blues and R&B. Belushi soaked up the music like a sponge and soon developed his idea for The Blues Brothers, first as a skit on Saturday Night Live and then as a major motion picture and a best-selling record album and concert tour. The album, Briefcase Full Of Blues, is dedicated to Curtis Salgado, and, as a nod to Salgado, Cab Calloway’s character in the film is named Curtis. The Blues Brothers’ set list was strikingly similar to the shows Salgado was delivering on a nightly basis. As Salgado was getting more serious about his career, he realized some of his band mates were not. It was then that Salgado joined forces with Cray and formed a new, more forceful Robert Cray Band. As the stature of the group grew, Salgado found himself sharing stages with blues icons like Muddy Waters, Bobby Bland and Bonnie Raitt. The band performed a transcendent set at The 1977 San Francisco Blues Festivalto thunderous ovation before backing up the great Albert Collins. After Salgado and Cray parted ways in 1982, Curtis went on to front Roomful Of Blues, singing and touring with them from 1984 through 1986. Back home in Oregon, he formed a new band, Curtis Salgado & The Stilettos, and was once again tearing it up on the club scene. He wrote many new songs, and honed his band to a razor’s edge before releasing his first solo album in 1991 on the fledgling JRS label. The group toured the country and began developing a strong following. His friend and fan Steve Miller invited Curtis and his band to open for him on a summer shed tour in 1992. Two years later, Salgado spent the summer on the road singing with Santana. In 1997 he toured with Miller again and performed in front of an audience of millions on NBC television’s Late Night With Conan O’Brien. Salgado then joined forces with Shanachie Records in 1999, putting out four critically acclaimed albums over the next nine years and finding his biggest audience yet. In 2006 Salgado was sidelined when he underwent a successful liver transplant and then shortly afterwards was diagnosed with and then beat lung cancer. Like so many musicians, Curtis had no health insurance. His medical expenses were paid for in part by a huge outpouring of love and money from his fellow musicians and his huge Northwest fan base. He bounced back with a perfect bill of health in 2008, releasing Clean Getaway. Billboard said the album was a “tour-de-force, showcasing Salgado’s range and power as a vocalist” and that it featured “hard-nosed blues, beautifully nuanced phat and funky R&B.” Blues Revue called it “one of the best records of the year.” Curtis tours heavily, leaving fans excited and hungry for more everywhere he plays. He has performed at festivals all over the world, including The San Francisco Blues Festival, The Chicago Blues Festival, Memphis’ Beale Street Music Festival, The Tampa Bay Blues Festival, Denver’s Mile High Blues Festival, Toronto’s Waterfront Blues Festival, Thailand’s Phuket International Blues Festival and Poland’s Blues Alive Festival. Now, with Soul Shot, Salgado is ready for more, tougher and more focused than ever. He will again hit the road hard, proving his reputation as a fire-breathing live performer night after night. And that’s just how he likes it. “Always give it your best,” he says. “Be honest and be real. Treat every show like it’s the biggest night of your life.” With Soul Shot and a long list of tour dates already planned, the biggest performances of Curtis Salgado’s life are surely yet to come.